Croughan’s SuperValu in Athlone has scooped the prestigious award for ‘Best Presentation’ in Ireland at the annual Checkout Best in Fresh Awards. 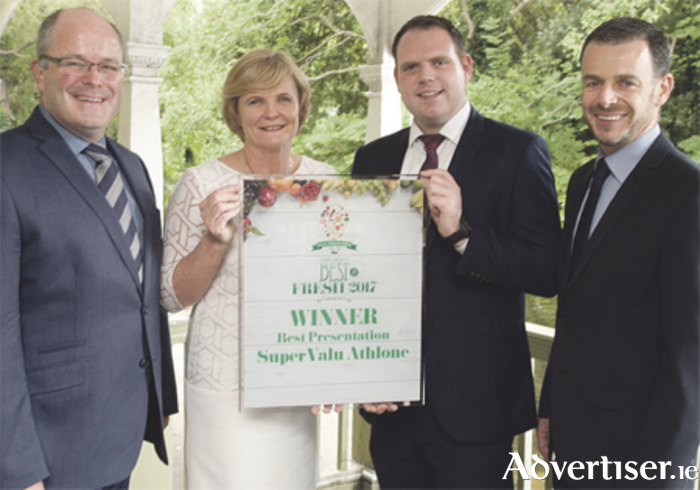 This award acknowledges Croughan’s SuperValu in their ongoing commitment to delivering an unrivalled fresh offering at great value prices, while striving to support Irish suppliers. Some of the biggest names in Irish grocery descended on The Shelbourne Hotel for the awards, the only annual event to acknowledge excellence in fresh produce retailing. Some of Ireland’s most innovative multiples, independent stores, forecourts, delis, and specialist outlets competed for the awards. More than 200 retailers were present at this year’s event to celebrate outstanding industry achievements in the areas of fruit and veg offerings, fresh meat and fish, food-to-go, and the myriad of other categories that comprise a winning fresh offering.